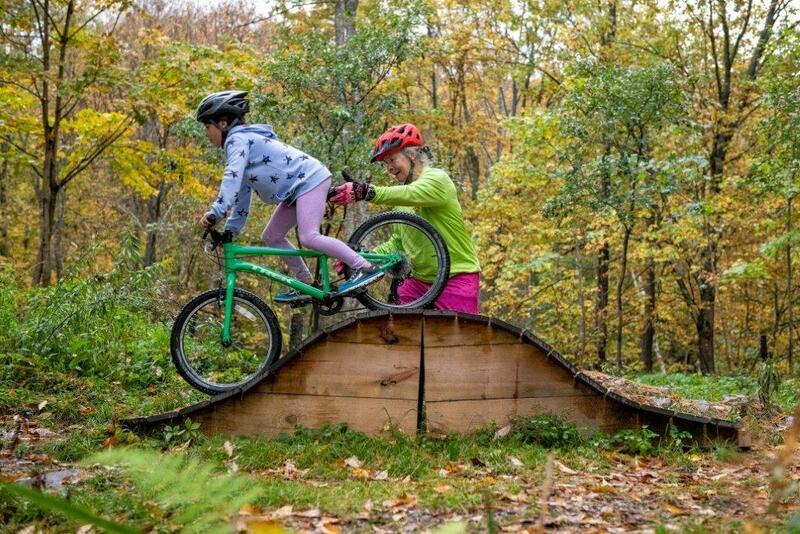 Kids enjoy the trails at Pine Hill Park, which boasts around 26 miles of trails stretching to nearby Proctor. Organizers say the park's popularity is growing and helped bring in more than $1.3 million dollars to the local economy last year. In 1921, Rutland businessman and former mayor Henry Carpenter donated 273 acres of land to the city for a park. Over the years adjoining land was added, and today Pine Hill Park covers more than 300 acres. While city residents have enjoyed the greenspace and the park's swimming holes for years, it wasn’t until the early 2000s, that mountain bike enthusiasts began carving out an ever-growing network of trails. 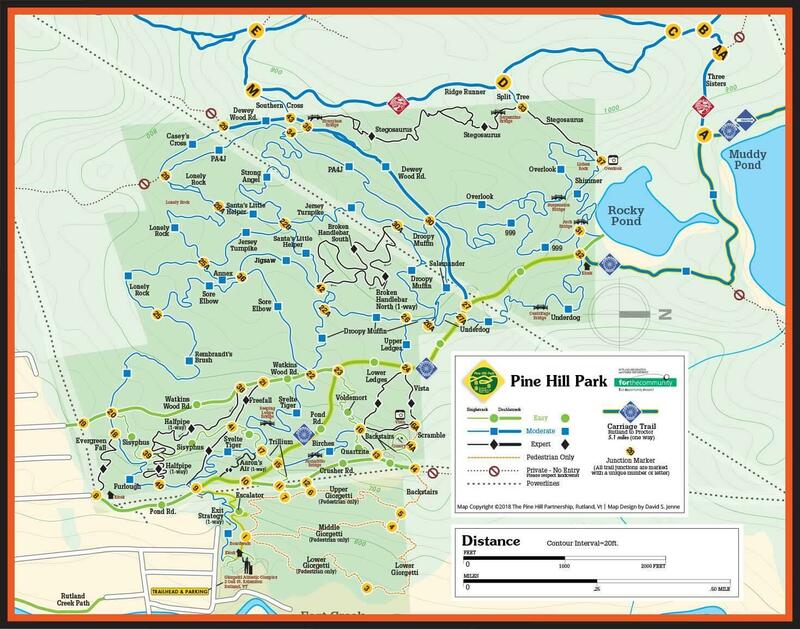 Map of more than 50 hiking and biking trails at Pine Hill Park in Rutland. Today this group of volunteers, called the Pine Hill Partnership, has created nearly 17 miles of trails within the park and connected to other trails that stretch to nearby Proctor and Rutland Town. Partnership members say traffic is way up and the recent purchase of a snow groomer now ensures year-round use. Andrew Shinn, Pine Hill Partnership's president, said mountain biking has become much more popular in recent years and Pinehill Park has tapped into that. Rebecca Mattis, is a member of the Rutland City Board of Aldermen, as well as a member of the Pine Hill Partnership. “When I first came to Rutland, Pine Hill Park was one of the first places I went to. I’m a hiker, not a mountain biker," admitted Mattis, "at least not yet,” she added laughing. But she said the trails are enjoyed by dog walkers, runners and hikers as much as bikers, which is a big part of the park's appeal. “And it speaks to not just the beauty of the area, but it speaks to what a small group of people can accomplish when they have a great idea,” she went on. Shelley Lutz, an early member of the Pinehill Partnership encourages a young mountain biker. She says the number of young families using the trails in Rutland has grown significantly in recent years. About 50 members of the Pine Hill Partnership held their annual meeting Monday evening in Rutland. They invited leaders from several other nearby trail networks including Slate Valley Trails in Poultney, Green Mountain Trails in Pittsfield, and the Killington Mountain Bike Club. Seth Westbrook came to Monday's meeting on behalf of the Woodstock Area Mountain Bike Association. He said he's been riding for years, and was excited to see all the new trails in Vermont. “It’s growing and everybody is looking for other places to ride," said Westbrook. "And trying to connect with other networks as much as possible is kind of a big thing within the state right now." Rutland’s Pine Hill Park covers 300 acres of wooded hillside. Over the years, volunteers have created a 16-mile network of winding trails – a woodsy nirvana for mountain bikers like Shelley Lutz. Organizers hope a new $200,000 marketing initiative showcasing Rutland County — rebranded as the Killington Valley — will entice professionals in cities like New York and Boston to visit the region. Outdoor recreation brings in $2.5 billion a year in consumer spending in Vermont, but many believe the state could bring in even more. The state wants to grow Vermont’s outdoor recreation economy, and if the recent interest in a new grant program is any indication, municipalities across Vermont are ready to get on board. Recreation businesses involving activities such as skiing, hiking, mountain biking and boating bring a lot of money into Vermont. But until now there hasn't been an organized effort to bring all of those businesses together and possibly provide some organized state support.